I love seeing Adrian's face light up when he sees a new activity set up waiting for him. 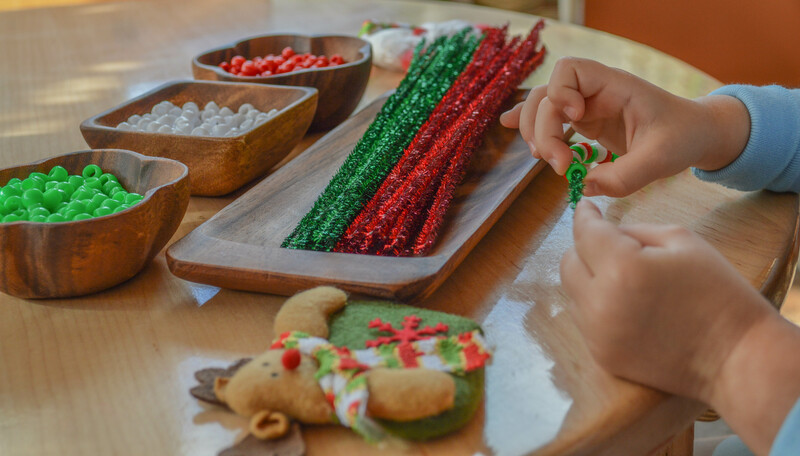 Today, we are threading Christmas-colored beads on pipe cleaners, making candy canes which can be hanged as ornaments, placed in jars as decorations, or even given as gifts. First, make a knot at the end of a pipe cleaner so that the bead does not fall off once threaded. This activity is great for developing fine-motor movements. Threading beads requires coordination of small muscles in hands and fingers, leading to strong fine motor skills, which are essential in completing tasks such as writing, drawing, putting puzzle pieces together, cutting, using a fork or spoon, zipping, buttoning, tying shoelaces and so forth. To succeed in performing many of such critical tasks, a child needs to have well-developed fine motor skills, which are achieved by practice! I try to make such practice diverse, interesting, and capable of sustaining attention. This activity definitely sustained Adrian's attention, and it required his concentration, patience, and precision while developing his memory (he had to remember the pattern after-all). Adrian just turned three years old, so for him, three-color-pattern was fun and not too overwhelming. He kept going back though and checking if he did it right: "red-white-green" he would repeat … "red-white-green." This activity is also self-correcting as Adrian noticed few mistakes, and was able to go back and take some beads off a pipe cleaner and start again, concentrating even more. "One for Santa, one for me!" Adrian made a three-color-pattern, just like a candy cane. With smaller children, I would suggest doing a simpler pattern, or none at all and just having the child use his/her fine-motor skills learning to thread a single color bead on a pipe cleaner. If the child enjoys, offer a pattern with just two alternating colors (for example red-white, as on the picture above.) For an older child, on the other hand, you might want to create a longer pattern: four + color combinations. A 🎅🏻 Christmas Inspired Heart! Happy threading! I have a feeling, we will end up with many candy canes. For more on Christmas inspired activities, see here "🎄Christmas Tree from Montessori Number Rods and Knobless Cylinders." For math, see here "🎄Christmas Odd & Even Math lesson (Numerals and Counters)." For sensorial activity, see here "🎅🏻Christmas Inspired • Fill The Ornament 🎄Sensory Bin."